These are Yellowfin Tuna Steaks, the incredible, mild, and juicy seafood wonder that's great on the grill or sautéed indoors. You can sear them as little as you like or cook them all the way through... the flavor is amazing! 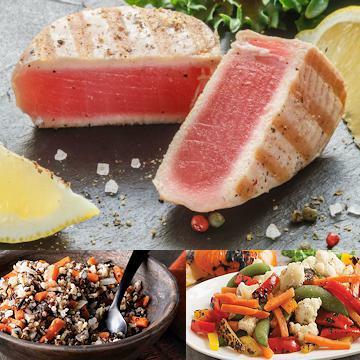 Your gorgeous tuna steaks will be served with easy-to-prepare superfood five-grain rice pilaf and vegetable medley for a colorful and healthful plate. Thaw in Refrigerator. When thawing, remove from plastic packaging. Cover and refrigerate below 38°F. Once thawed, consume within one to two days. Quick Thaw Method: Unpackage desired number of fish fillets and place in a sealable plastic bag. Remove as much air from the bag as possible and immerse in cold water for approximately 30 minutes. Medium Rare Ahi Tuna Steaks: Grill: Preheat grill. Brush tuna steaks with melted butter or olive oil. Season as desired. Grill steaks 60-90 seconds on each side, or until seared. Thicker portions may take slightly longer. Avoid over cooking. Pan Sauté: Preheat 1 tsp of olive oil per portion in a sauté pan over high heat. Season as desired. Place tuna steaks pan and cook for 60-90 seconds on each side, or until seared. Thicker portions may take slightly longer. Medium Ahi Tuna Steaks: Grill: Preheat the broiler or grill. Brush tuna steaks with melted butter or olive oil. Season as desired. Broil or grill steaks 4-5 minutes on each side, until opaque throughout. Thicker portions may take slightly longer. Avoid over cooking. Oven: Preheat oven to 400°F. Brush steaks lightly with melted butter or olive oil. Season as desired. Place tuna steaks on baking sheet on middle rack of oven. Bake for 10-12 minutes or until opaque throughout. Avoid over cooking. Pan Sauté: Preheat 1 tsp of olive oil per portion in a sauté pan over medium heat. Season as desired. Place steaks in pan and cook for 4-5 minutes. Flip, and continue to cook for 3-4 minutes. Do not thaw. Microwave (1100 Watt): Remove from film. Microwave on HIGH 4 minutes. Let stand for 1 minute. Internal temperature must reach 165°F, continue heating until temperature is reached. Stir and serve. Oven: Preheat oven to 350°F. Remove from film and bake on baking sheet uncovered for 20 minutes. Stir. Bake an additional 20 minutes uncovered, until internal temperature reaches 165°F. Carefully remove from oven. Stir and serve. Ingredients: Brown Rice, Carrots, Black Barley, Wild Rice, Onions, Red Quinoa, Red Rice, Water, Butter (Cream, Salt), Chicken Broth, Olive Oil, Vegetarian Vegetable Base (Cooked Vegetables [Carrot, Celery, Onion], Tomato Paste, Corn Oil, Yeast Extract, Potato Flour, Salt, Onion Powder, Garlic Powder And Flavoring), Flavor, Salt, Corn Starch.